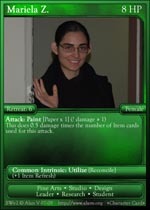 Welcome to Alan's Card Games. This is a compilation of all the card games I've created over the years including, history, status, and (in some cases) downloads. Card games are in reverse-chronological order. 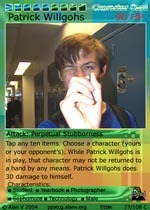 A customizable fixed-deck card game involving player trading to complete episodes and gain views, themed around the YouTube duo Smosh. The re-revamp of RPG Get! 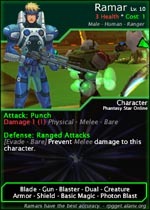 is a combat-centric customizable card game based around RPGs such as PSO, Grandia 2, and Evolution. 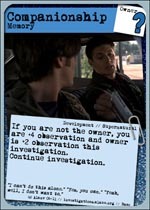 A card game system based around finding clues and solving investigations, themed around TV shows such as Supernatural, Psych, and Torchwood. The revamp of RPG Get! cleans up the rules and gameplay; still based around completing missions and defeating enemies in an RPG setting. Causing drama is fun, especially when it's people you know. 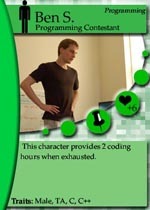 A fixed card game where your people work on completing tasks to build awesome software. It's back! 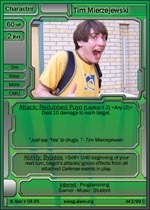 The fifth in the PPA TCG gameplay series, revamped to be more generic (but still with killing your competition)! Some card games have side decks. Some card games have lots of side decks. This card game only has side decks. 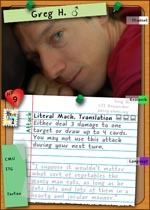 A card game for David's webcomic, based on causing and fixing blunders. 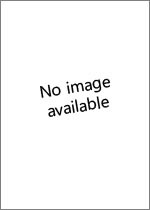 A card game based on a dream, where players try to obtain artifacts while avoiding corruption from the forces of evil. A fixed card game based on people and tasks at my final college internship, where the goal is to build products bigger and better. The revamp of Student Wars, still based around obtaining a 4.0 GPA and killing your competition. A fixed card game where the goal is to make the most money by popping out babies. 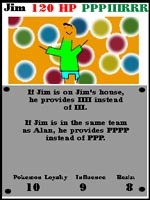 A fixed card game where the goal is to stack Tims. 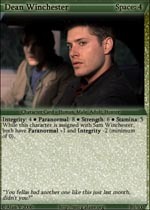 A customizable card game based on the TV series Supernatural, based around solving mysterious happenings as a Hunter. A fixed card game based a little on Memory where the goal is to accomplish your goal through cluster citizens' resources. 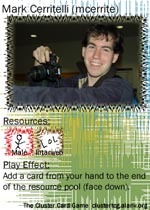 A fixed card game based on collecting all the STDs. Yes, those STDs. 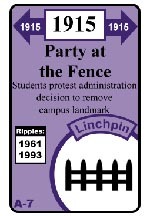 A version of Chronauts (a card game produced by Looney Labs) with the timeline replaced with CMU events; a collaborative effort with Tim and Tim. 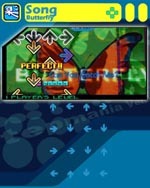 A fixed card game based around stepping along to DDR songs. 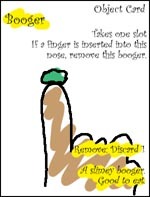 A fixed card game where you fill up your nose with nose hair and evolve it while filling your opponents' noses with foreign objects. A customizable card game based around various Dreamcast RPGs, with a goal of completing missions by defeating enemies. Another revamp of the PPA TCG that added more strategies and rebalanced the game, but still based around achieving a 4.0 GPA and killing your competition. 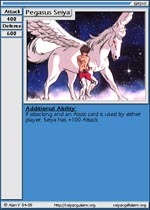 A fixed card game based on the Saint Seiya (Knights of the Zodiac in the US) anime series, based around combat. A revamp of the PPA TCG, cleaning up the characteristics list and evening out the power between cards; still based around achieving a 4.0 GPA and killing your competition. 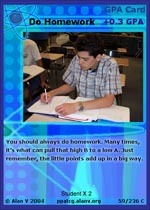 A trading card game created to help fund the school yearbook, based around achieving a 4.0 GPA and killing your competition. 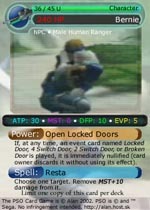 A redo of the PSO TCG to be more playable; based in the Phantasy Star Online world with cards from Skies of Arcadia. 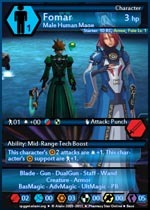 An card game based on the MMORPG Phantasy Star Online, centered around combat. 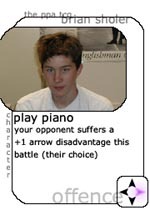 A fixed card game created on a whim and included as part of the 02-03 PPA Yearbook, based around students and staff battling. 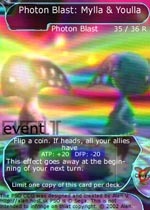 Another collaborative effort with Jim M. for a card game based on the Pikmin game for Gamecube. 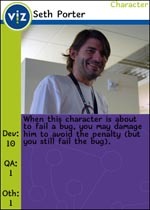 A card game with the goal of building the biggest and best website from components. An collaborative effort with Jim M. that was mostly concepts for an old card game based on the Evolution series of RPGs for the Dreamcast. A card game based on the classic Blizzard RTS game that more had more in common with tabletop gaming than card games. 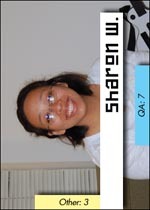 A card game featuring me and my friends.